In part 4 of ‘K League Tactics’ we take a look at current leaders Jeonbuk. Jeonbuk is led by long-time manager, and former Korea national team boss, Choi Kang-Hee. Jeonbuk struggled a bit to battle on the both the domestic and Asian fronts in the beginning, and since they were eliminated from the latter (coincidentally at the hands of fellow Korean side Pohang), they went on an excellent 12-match unbeaten run (10 wins 2 draws) which saw them go top of the K League table. That run was followed by two straight defeats (to FC Seoul and Jeonnam Dragons) which has seen Pohang move level on points. Can Jeonbuk keep their rivals at bay and reclaim the title? Choi Kang-Hee has essentially built his team to be able to play in two formations. A more attacking 4-2-3-1 and a more defensive 4-3-3. In that sense, it’s somewhat similar to what Jose Mourinho is doing at Chelsea. The above formation shows the 4-2-3-1, which is used slightly more often since Jeonbuk is better than most of the teams in the league. The 4-3-3 is used when plays against other top half sides. The only real difference is the positioning of Lee Jae-Sung. In the 4-2-3-1 he is often used deeper next to another holding midfielders, Shin Hyung-Min/Kim Nam-Il/Jung Hyuk. In the 4-3-3, Lee Jae-Sung assumes the advanced role of the midfield three ahead of two holders. The “Lion King” remains king – Kim Shin-Wook may be the national team’s (seemingly) next go-to guy, and there are some talented up and comers such as Kim Seung-Dae, but in terms of overall game, Lee Dong-Gook remains the best in the K League. His age (36) is concerning, but Lee is currently the league’s top scorer (11 goals) and is joint second in assists (6 assists). Experienced – Most of Jeonbuk’s regulars have been around the block before, either with Jeonbuk or other K League sides. There are a few youngsters like Lee Jae-Sung, but most know what it takes to play and succeed in the league. Thin up top – While Lee Dong-Gook is enjoying an excellent season thus far, his replacement Kaio isn’t quite up to the same standard. That being said, Kaio’s goal scoring record isn’t bad, but his overall contribution to Jeonbuk’s attack is less than Lee’s. Lack of passing/possession players – While Jeonbuk has plenty of quality players, they don’t really have one that likes/is able to sit on the ball and relieve pressure or maneuver out of tight spaces. It’s a team built around players who can break up play and then get towards goal quickly. Earlier this season Choi Kang-Hee said (sorry, too lazy to find the original article, just trust me) that he wanted Jeonbuk to play like Germany. Meaning he wanted the team to use ‘gegenpressing’ or ‘counter pressing’. If you’re not really into the whole tactics thing, it essentially is a well coordinated, high pressing tactic. As soon as Jeonbuk loses the ball, the team presses the ball carrier in an attempt to A) win the ball back deep in opposition territory, or B) force a poor pass where they can easily win the ball (usually around the halfway line or just inside the opposition half). Jeonbuk’s improvement in using this tactic is probably the biggest factor in their current run (12 matches unbeaten). Jeonbuk’s style is very much on the direct side. Lee Dong-Gook remains the key player in their play. Perhaps it’s because Lee is from an older generation of play, but he remains one of, if not the, best center forwards in the league in terms of his hold up ability. Many of Jeonbuk’s attacks are based around him getting the ball with his back to goal, and then distributing to one of the three attackers running past him. The addition of Han Kyo-Won has been helpful as it gives Jeonbuk a more balanced attack with him on the right and Lee Seung-Gi on the left. When he plays, Leonardo is the one that can split defenses apart as he is very good on the ball and has good vision. Lengthen the field – Easy to say, more difficult to do, but it is important to get Jeonbuk back into their half. Choi Kang-Hee doesn’t play with, or really have, a deep-lying playmaker to initiate attacks, so Jeonbuk does become a more predictable “long ball” team when the centerbacks are forced to pass from their defensive third. Suffocate Lee Dong-Gook – It’s important to deny Lee the time and space to control the ball and distribute. Despite his age, Lee is still strong and can hold off most K League defenders, so completely denying him the ball is difficult, but it’s important that defenders make things uncomfortable for him. Lee’s passing is hit-or-miss at times, and defenders can make it harder for him to get quality passes off. Counterpress – Prior to their 2-0 loss a couple weeks ago, Pohang had defeated Jeonbuk three times this season. Another team that likes to counterpress. Jeonbuk relies on their defenders and two deeper midfielders to play those direct passes, and none are really good on the ball under pressure. At best you can get the ball off them. At worst you can make them make a bad pass under pressure. Stand off them – It’s tempting to tell your defenders not to press and just stay between the goal and the ball as Jeonbuk’s wide men (Lee Seung-Gi and Han Kyo-Won) both have pace, but it’s a risky strategy because it allows Jeonbuk to shorten their field and makes it harder for your side to break out. Be too “nice” – Related to point 1, don’t let Jeonbuk just possess the ball and pass it around. As mentioned before, Jeonbuk doesn’t really have players that can use skill to keep the ball under pressure, so it’s a mistake to let them have the ball pressure free. Play too conservatively – Against big sides like Jeonbuk it’s tempting to keep your players deep and only go forward when absolutely possible (safe from counters). But, remember Jeonbuk’s tendency is to drop deep when their press fails. Committing only 2-3 players to attack won’t work too well, so some courage is needed to get 5-6 players forward. 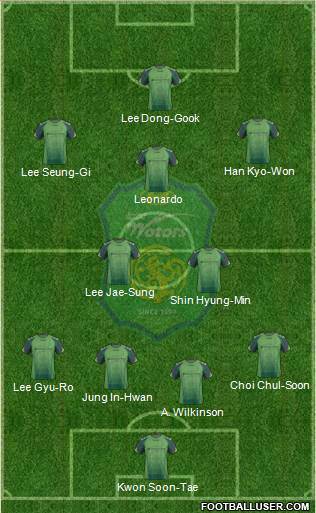 Jeonbuk is a strong team with quality players. They are solid, if a bit on the unspectacular side. Choi Kang-Hee remains a polarizing figure for national team fans (particularly it seems the overseas ones), and while he was insufficient at the international level, he remains one of the best K League managers. His biggest task was to straighten out an incredibly leaky defense last season, and he’s done that extremely well. After 23 games Jeonbuk has conceded just 17 goals. In comparison, last season after 23 games they had conceded 32 goals. And he’s managed to do this without sacrificing too much on the attacking side (40 goals this season vs 45 last season after 23 games). That being said, I’ve yet to be completely convinced by Jeonbuk (except when they play much weaker sides like Busan, Seongnam, and Gyeongnam), and again this falls on Choi Kang-Hee. While he’s done well to make Jeonbuk a more aggressive, counter-pressing team at times, when they get the lead (particularly against stronger sides) he still tends to have them drop into a very deep defensive shape and invite pressure. Perhaps it’s a personal thing of mine, but I always prefer that big teams – strong teams – kill opponents off. You go up 1-0, 2-0 you keep the pressure on and make it 3 or 4, not drop deep and defend. Jeonbuk’s style and tactics are effective, but can be overcome, and if I was a fan, I would worry a little bit about them come the split. Especially if Pohang and possibly Suwon or Jeonnam are within six points or less. Jeonbuk is capable of taking care of the bottom half teams, but the top half can be a struggle for them, and that five-game run where they’ll play the top half for the title could do them.